Over at Tor.com, I answer The Pop Quiz at the End of the Universe. Looking a few months ahead, I am happy to announce that I’ll have a booksigning on December 6th from 1-3pm at the Metro Center Barnes & Noble in Phoenix. This is a more casual thing–no reading–but I’ll sit at a table and lure in people with cookies. If you’re in the area, please pencil in the date and drop by to say hi! I was tagged by my agent-sister Alyssa Goodnight to take part in the Meet My Character Blog Tour. Since I still have The Clockwork Dagger on my brain (gee, I wonder why? ), I thought I’d talk about my heroine. She’s completely fictional, though inspired by medics, nurses, and corpsmen who have served in recent wars. It’s set on a secondary world (based on Earth, but not Earth). The geography is based on the area around Seattle, Washington, and the time period is inspired by post-World War I Europe. The primary action is in a kingdom named Caskentia. 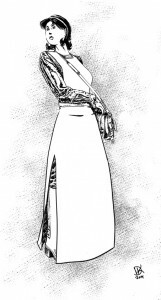 Octavia was orphaned at age 12 when an enemy airship crashed atop her village. For the past ten years, she’s been mentored by Miss Percival at an academy for medicians in training. Much of that time has been spent in field hospitals at the front line of an endless war between Caskentia and the Waste. She has unusually powerful healing skills drawn from a world tree called the Lady. Armistice has been declared–yet again–and Octavia is setting out to establish her own medical practice in a village. When her airship journey is plagued by murder and poison, it becomes clear that Octavia is the intended target. She wants a true home, a place to belong. Instead, her trip becomes a scramble to stay alive at all. The book is out as of the 16th! 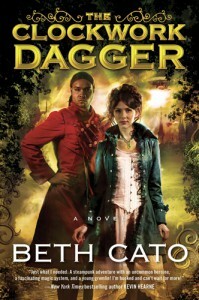 The Clockwork Dagger was published by Harper Voyager and it’s available everywhere. Here you can read the back cover copy and find links to many booksellers. It’s out! It’s real! Wheeeee! Writers, feel free to copy/paste the meme and continue it! 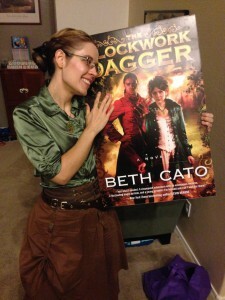 First of all, the ZOMG link of the week: an amazing review of The Clockwork Dagger over on NPR.org. Yes, THE NPR. This means I’ve now had features in Entertainment Weekly, USA Today, NPR.org, and the Arizona Republic in the past week and a half, and I wasn’t even arrested! 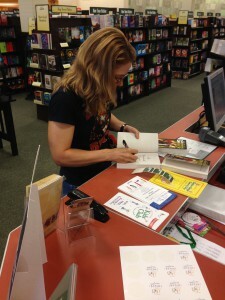 I am still blog touring and popping up here and there and everywhere. – My story “Post-Apocalyptic Conversations with a Sidewalk” was just published in Nature! This is one of my favorite works for the whole year. – I’m interviewed at The Nameless Zine. – Rhonda Parrish interviewed me at her blog. – The second half of my podcast is up at Kingdoms of Evil! The blog tour for the book and parasol ENDS TODAY. Check it out and spread the word, please! Let’s finish off Cake Month with a cake of chocolate wonder, shall we? I made this while visiting my parents’ house for the 4th of July. My brother’s birthday was in June and I let him pick the recipe for me to try. I prepared all of the dry ingredients beforehand and toted them to California. I think he chose pretty well. This actually reminded me of how our local Savemart bakery used to make their Oreo Cake back in the late ’80s. This is heavy duty chocolate with the frosting and all, though the cake layers had a light crumb. It may not be as dense as some cakes, but it’s still a chocolate fist to the face. I was a little disappointed in the filling layer, though–it wasn’t even visible in the cut cake! 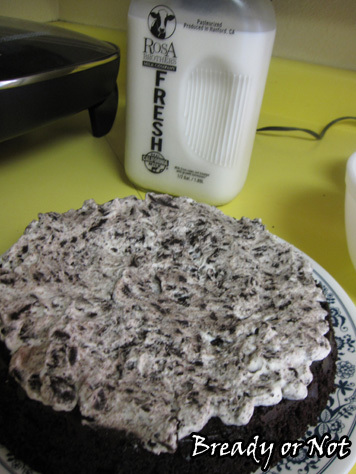 Therefore, I modified the ingredients to double the cream and sugar there. Since I was in my hometown, it was only right that I use local ingredients. I used Rosa Brothers milk–it comes in a glass bottle and everything! 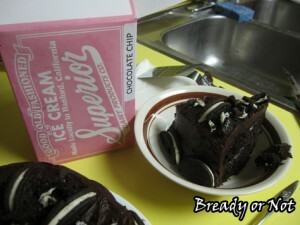 Then I had to serve the cake with Superior Dairy chocolate chip ice cream, the best ice cream anywhere. I’ve lived all over the country. I know. Like most chocolate cakes, this one improved after a day in the fridge. Yet another reason why chocolate cake is awesome. Preheat oven to 350-degrees. Prepare two 9-inch round baking pans by applying nonstick spray, lining with parchment, and then spraying again. 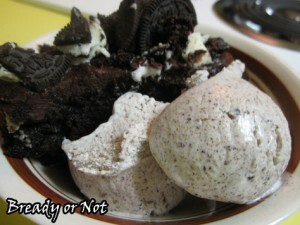 Set 5-8 Oreo halves down in each pan. These will be the cream sides, with the cream facing up. Set the black halves aside to be used in the filling. Add the eggs, milk, oil and vanilla; beat on medium speed for about 2 minutes. Stir in the boiling water. The batter will be very thin. Pour it very carefully into the prepared pans. Don't be surprised if the Oreos float around. Bake the pans for 30 to 35 minutes or until wooden pick inserted in center comes out clean. Cool them for 10 minutes; run a knife around the sides to make sure they are loose, then carefully remove the cakes from pans. Set them on wire racks and remove the parchment from the tops. Let the cakes completely cool. Beat together the cream, sugar and vanilla until they form stiff peaks. Gently fold in the cookie crumbs. Set up the bottom layer of the cake on the serving dish. 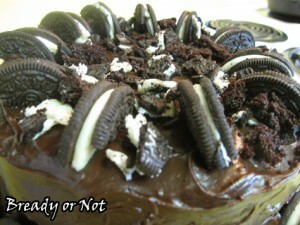 Depending on consistency, pipe the filling onto the cake or spread it on with a spatula. Set the top layer in place. 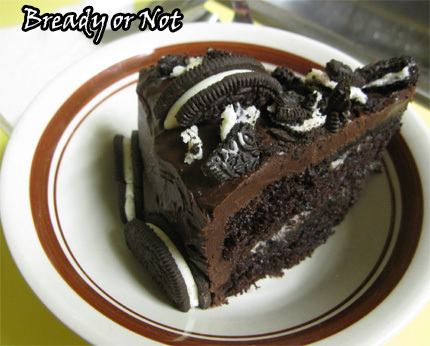 If need be, trim the sides of the cake to make them more even. Melt the butter. Mix in the cocoa. Alternately beat in the powdered sugar, milk, and vanilla. Add small amounts of milk until it reaches spreading consistency. Frost the cake around the top and sides. 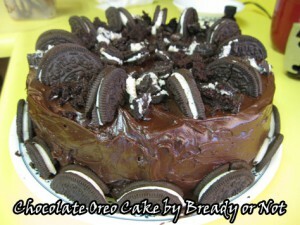 Apply the remaining halved Oreos around the bottom and the top; add any sliced-off cake crumbs as well. !Store the cake in the fridge, covered by a dome, foil, or wrap. Like most chocolate cakes, it actually tastes better after the first day. It can also be frozen in slices.